More rare than rubies or sapphires, moldavite is a bottle-green translucent stone of unearthly origins. Scientists postulate that a meteor shower in Germany some 15-20 million years ago liquified the landscape where the meteors landed, forming fused glass at very high heat, which was then ejected from the meteor craters in Germany and propelled hundreds of miles away, landing in the Moldau Valley of Czechoslovakia -- site of the only moldavite known to exist. A true ascension stone, prized by the metaphysical community. 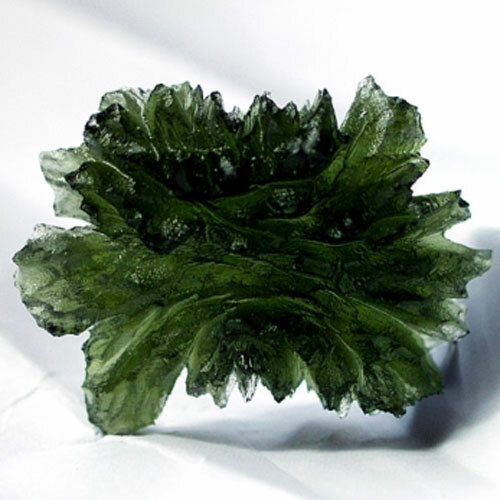 Read more about Moldavite in our Crystalpedia.